Earth’s changing weather always makes life interesting. Seeing weather on other planets through a telescope we sense a kinship between our own volatile world and the fluttering image in the eyepiece. 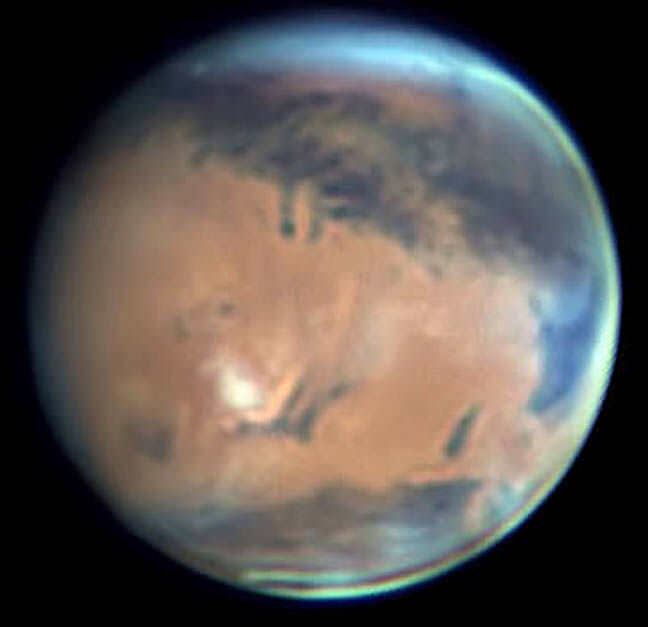 With the April 8 opposition of Mars rapidly approaching, you won’t want to miss a striking meteorological happening right now on the Red Planet. Map showing the most prominent dark features on Mars. 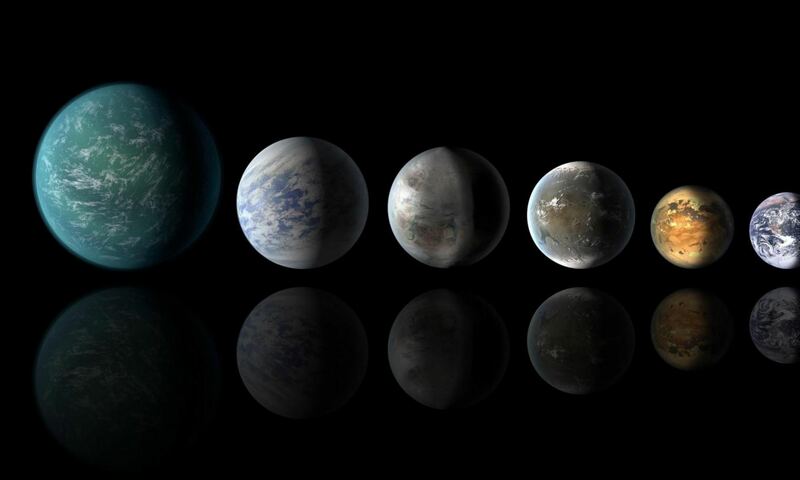 Hellas is at upper right. Credit: A.L.P.O. Winter’s already well underway in the planet’s southern hemisphere and there’s no better place to see it than over Hellas, Mars’ biggest impact crater. Hellas formed some 4 billion years when a small asteroid crashed into the young planet and left a scar measuring 1,400 miles (2,300 km) wide and 26,465 feet (7,152 meters) deep. Point your telescope in its direction in the next few weeks and you’ll see what looks at first like the planet’s south polar cap. Don’t be deceived. That’s Hellas coated in dry ice frost and filled with wintertime clouds. The Hellas impact basin, also known as Hellas Planitia, is 1,400 miles wide. After Mars’ Utopia Planitia and the moon’s South Pole-Aitken Basin, Hellas is the third largest confirmed crater in the solar system. Right now, Mars’ northern hemisphere, along with the north polar cap, are tipped our way. Though the cap is rapidly vaporizing as the northern summer progresses, you can still spot it this month as a small dab of white along the northern limb in 6-inch (15 cm) and larger telescopes. Use a magnification upwards of 150x for the best views. The south polar cap can’t be seen because it’s tipped beyond the southern limb. Along with nearby Syrtis Major, Hellas was one of the first features discovered with the telescope. Even in summer its pale floor stands out against the darker volcanic features of the planet. Though windswept and bitter cold now, Hellas’ great depth makes it one of the warmest places on Mars during the summer months. Mid-summer atmospheric pressure has been measured at more than 10 millibars, more than twice the planet’s mean. Afternoon high temperatures reach near the freezing point (32 F / 0 C) with nighttime lows around -50 F (-45 C). Winter temperatures are much more severe with lows around -22o F (-140 C). Carbon dioxide condenses as frost and whitens the floors of many craters during this time. We can only see Hellas when that hemisphere is turned in our direction; this happens for about a week and a half approximately once a month. European observers are favored this week with Hellas well placed near the planet’s central meridian from 1 – 4 a.m. local time. Why the outrageous hour? Mars rises around 10 p.m. but typically looks soft and mushy in the telescope until it’s high enough to clear the worst of atmospheric turbulence 2 – 3 hours later. North and South American observers will get their turn starting this Saturday March 22nd around 12:30 – 1 a.m. Good Hellas viewing continues through early April. Like Earth, Mars revolves from west to east on its axis, but because it rotation period is 37 minutes longer than Earth’s, Hellas and all Martian features appear to drift slowly eastward with each succeeding night. A feature you observed face-on at midnight one night will require staying up until 2:30 a.m. a week later for Mars to “rotate it back” to the same spot. To keep track of the best times to look for Hellas or anything else on Mars, I highly recommend the simple, free utility called Meridian created by Claude Duplessis. Set your time zone and you’ll know exactly the best time to look. While you’re out watching the Martian winter at work, don’t forget to also look for the shrinking north polar cap and bright, patchy clouds along the planet’s morning (east) and evening limbs. You can use the map above to try and identify the many subtle, gray-toned features named after lands in classic antiquity by 19th century Italian astronomer and Mars aficionado Giovanni Schiaparelli. I will you success in seeing Hellas and encourage you to share your observations with us here at Universe Today.